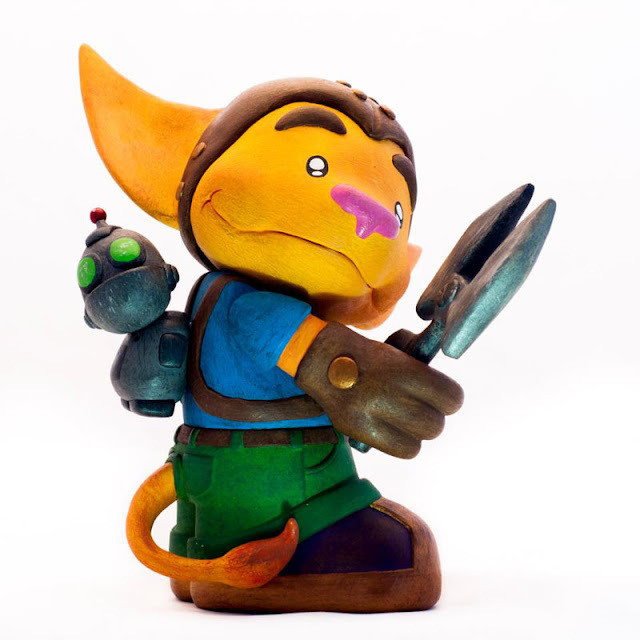 Just look at this Ratchet & Clank tribute by Bash. 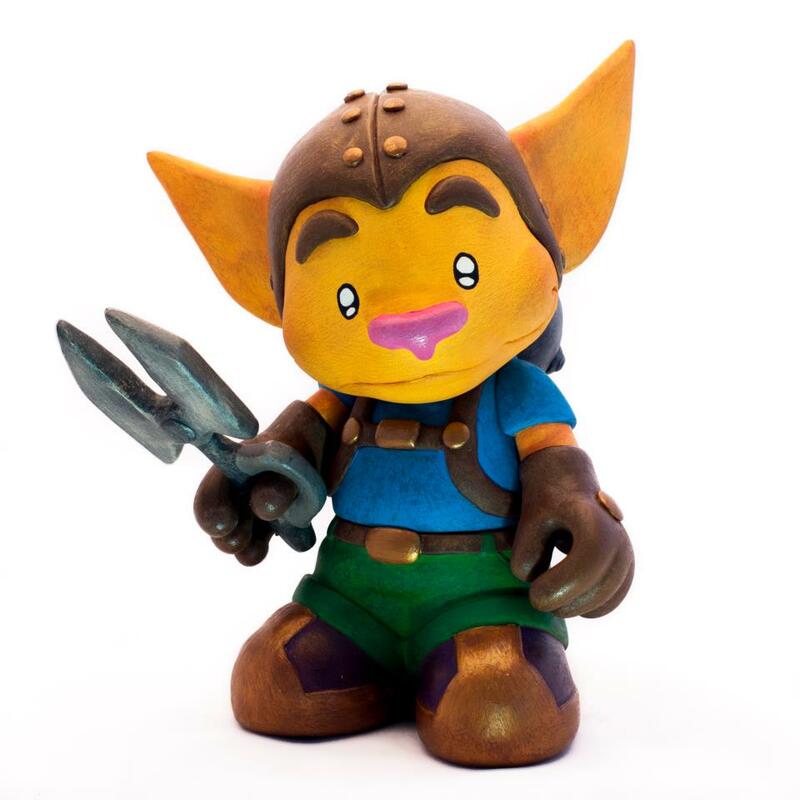 He used a Mascot for Ratchet and a Bot for Clank. When you are interested in buying this guy, than go to his store here. Fuller news! Fuller news! Read all about it! 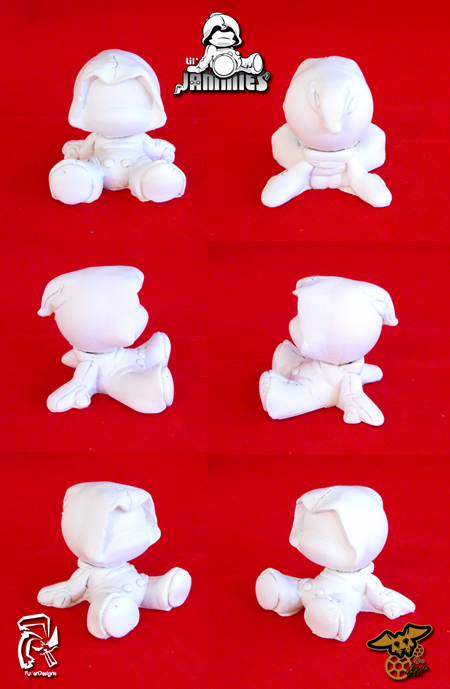 I am excited to share my first resin figure, Lil’ Jammies! I would also like to give a huge thanks to the (Master Caster) - Matt Anderson (aka Matt A*: http://www.facebook.com/Matt.Acustoms) for being so kind to help in the casting of them. Matt has been really gracious in the process and he has even taught me how to do the casting. 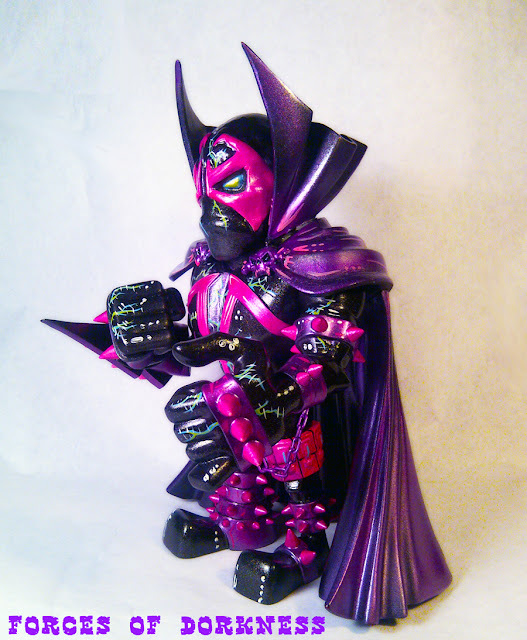 I would recommend his casting and outstanding artwork to anyone! I have been working on this design for quite some time now. I always wanted to be able to paint my own base and I feel this design is the perfect fit for my style. Cute but kickass! The Lil’ Jammie figure is a hooded character in pajamas. I have always had a fascination with hooded characters. The mysteriousness of what is underneath the hood has always intrigued me. So I had to start with the hood. That’s the beauty of this base, it can be anything. What is under that hood? In the future there will be interchangeable heads made. 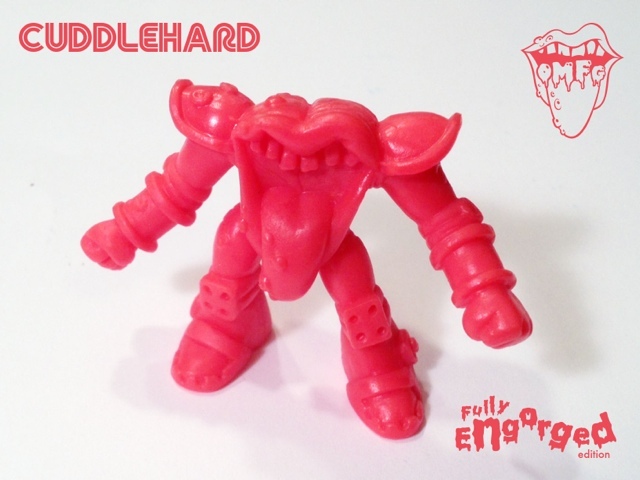 The figure is made of sturdy resin and the head is removable and can swivel. 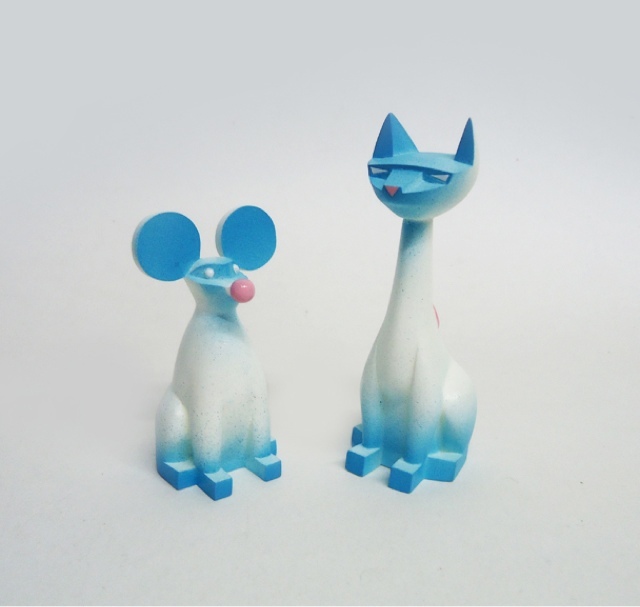 It measures at 2” length x 2.5” height; the perfect size to fit in anyone’s collection. These cute Lil’ Jammies are reasonably priced at $85.00 customized. Keep watching my store for more Lil’ Jammie characters! My first set had to be my favorite comic characters. I mean… who doesn’t like superheroes in jammies!? 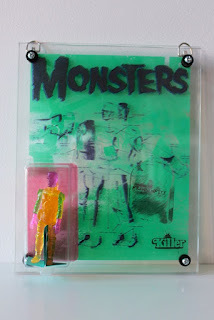 Remaining (In)Action Figure Show Works AVAILABLE NOW! That's right! The show went off without a hitch and now there are still some pieces available for sale at cluttermagazine.com anyone who can't make it to the gallery before the show closes on February 2nd. As of this post, all of the pieces below were still available, and many other choices as well. Clutter is also offering a Suckadelic Series 2 art-print. 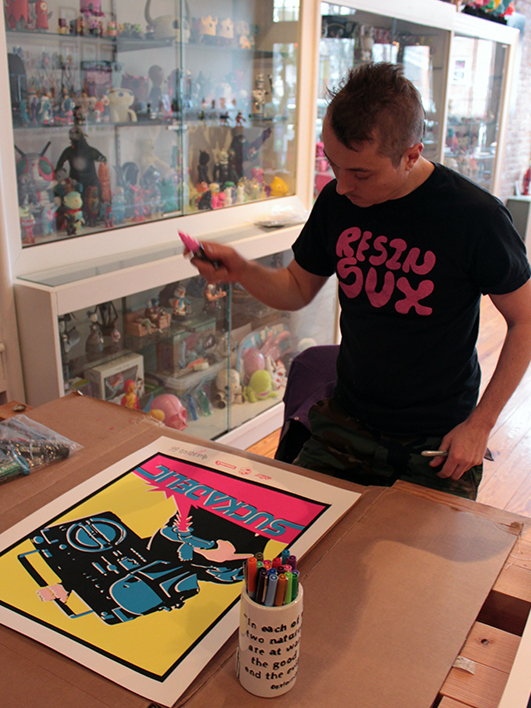 This 4-color beauty is 19x25, limited to 50, signed by the Sucklord, and will set you back $45. 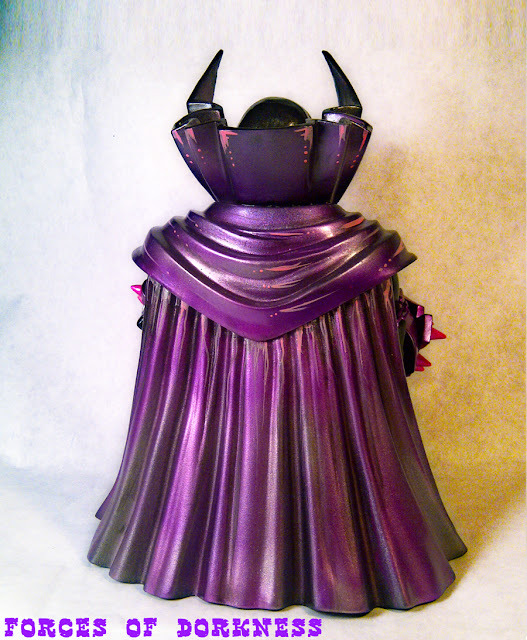 Check out Scott Kinnebrew's latest custom: a 2008 8" Medicom Hamburger Head Spawn. He calls it "Electro Spawn". It's available in the FOD store here. Payday is coming February 1st, 2013. 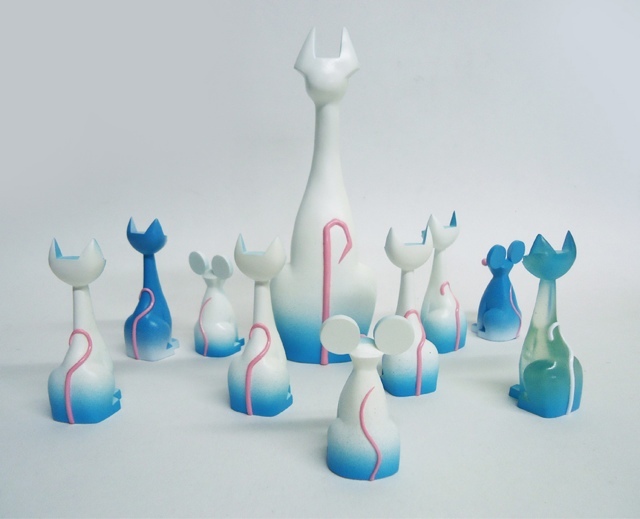 Soujohn from the innovative Mai Hiro team contacted us recently saying that he's been getting a lot of love on some of his older Hoodley works through his social media outlets, and he feels like he should give some love back. When asked what he planned to do to return the love, he said he was waiting for payday. 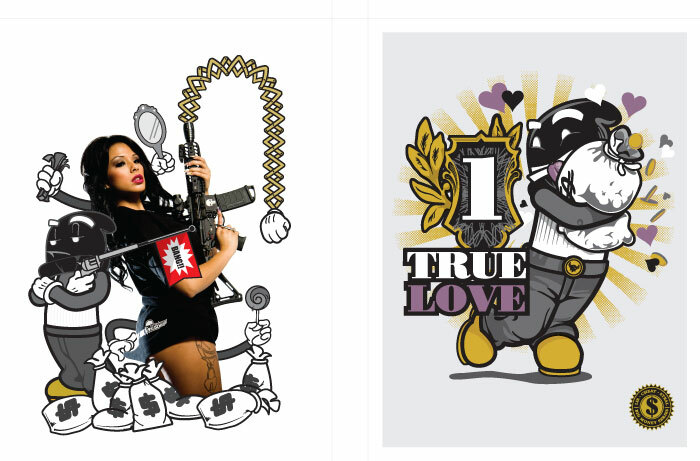 Starting Feb 1st Soujohn will be introducing The Big Payoff print series. 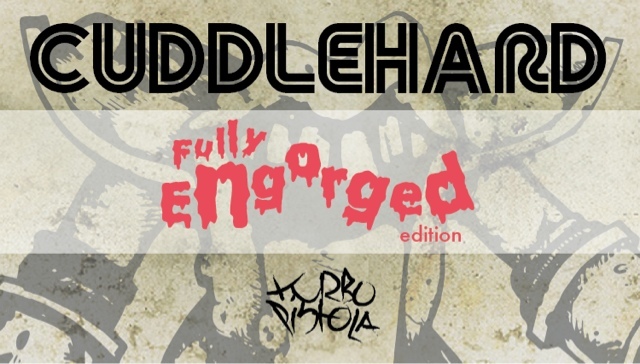 A new Hoodley print is going to be released at Hoodley's Stash Spot every other Friday until the end of the year. Each print is only going to be available until the following payday when it will then be replaced by a new print. Prints will run from $10 – $15. Each print will start out at the sale price of $10 for the first weekend that it becomes available, and then will return to the regular price of $15 Monday. I created this piece while stuck in my house in Brooklyn during Superstorm Sandy. Resin head, Chinese vacuum plastic body, and hand drawn label. Limited to 50 pcs. 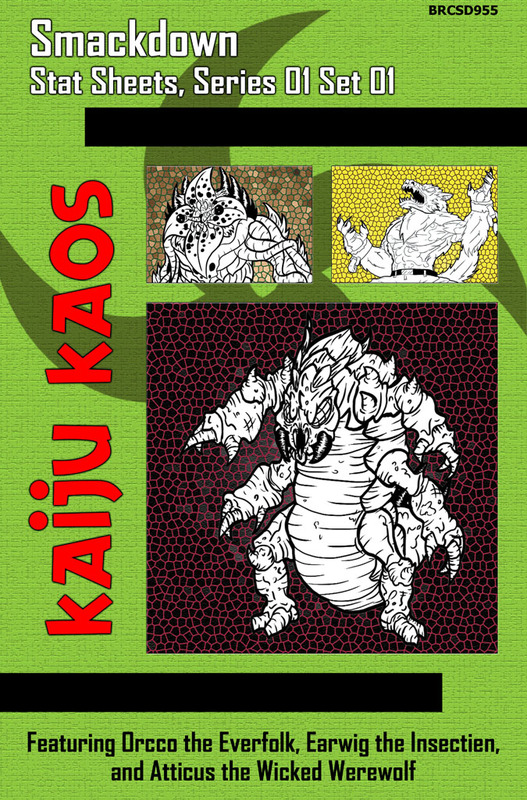 Bailey Records today announces the release of KAIJU KAOS: SMACKDOWN STAT SHEETS for our first set of limited edition minifigures now available at http://baileyrecords.storenvy.com. Buy the toys, play the game! 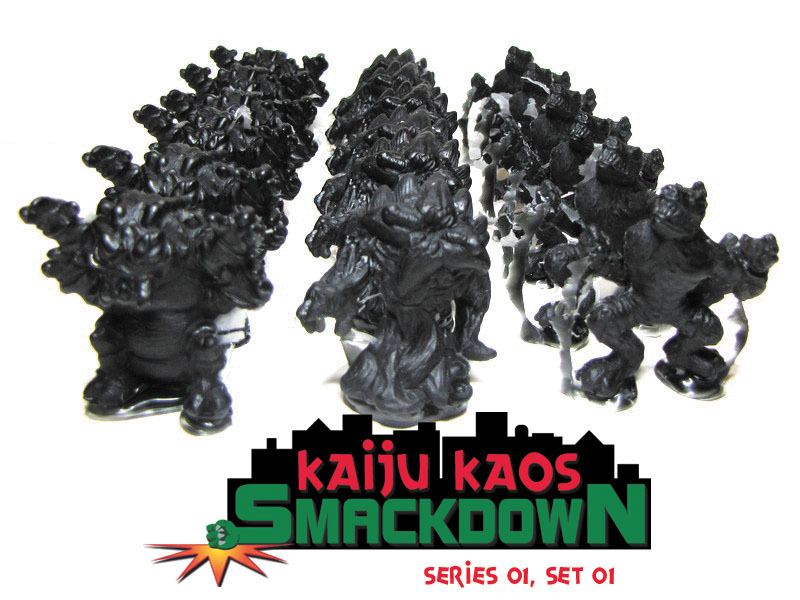 This PDF features 6 new stat sheets for use with the first set of SMACKDOWN minifigures. Stats for both the named characters and for generic, unnamed Scout Specialists that can be used to bolster your armies are included in this PDF. As a special offer, everyone who purchases a set of our limited edition minifigures will received a coupon code to get this PDF for free! KAIJU KAOS: SMACKDOWN is a “death match” variation of KAIJU KAOS where players quickly battle using one or more 45mm tall character models on a 2x2 foot tabletop. The object of the game is to be the last model standing by defeating your enemies. 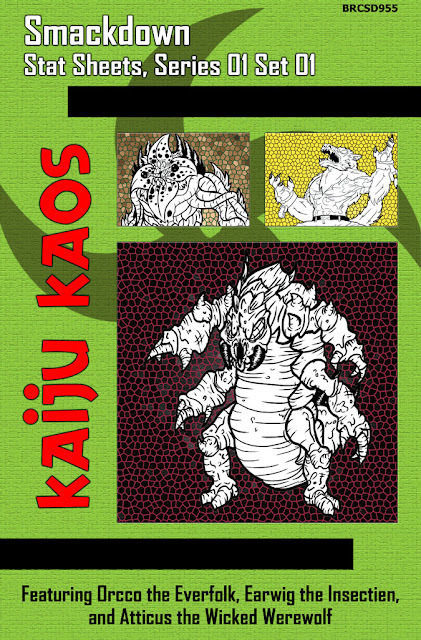 Every faction in KAIJU KAOS, along with a healthy dose of Mercenaries, will be represented in SMACKDOWN. 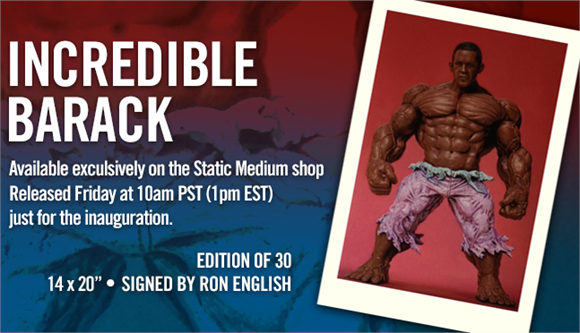 A new print from Ron English is available now exclusively in the Static Medium Shop. Celebrating President Barack Obama's inauguration on January 21st, the artist has released a limited edition print of the Commander in Chief entitled "The Incredible Barack." Each piece is signed and numbered by the artist, measures 14" x 20" and is limited to 30 pieces. Head over to the shop and pick up one of these while they last for $175. 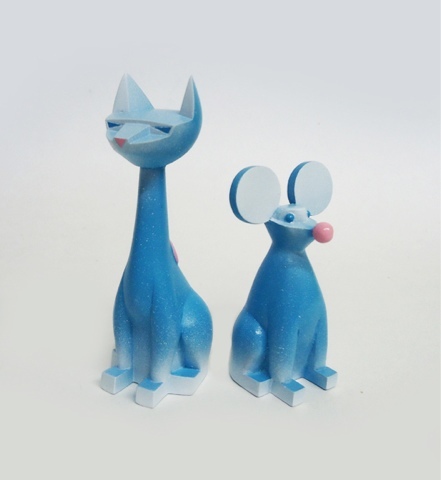 Wolf Voigt's Custom SolarColorDust OMFG on eBay! 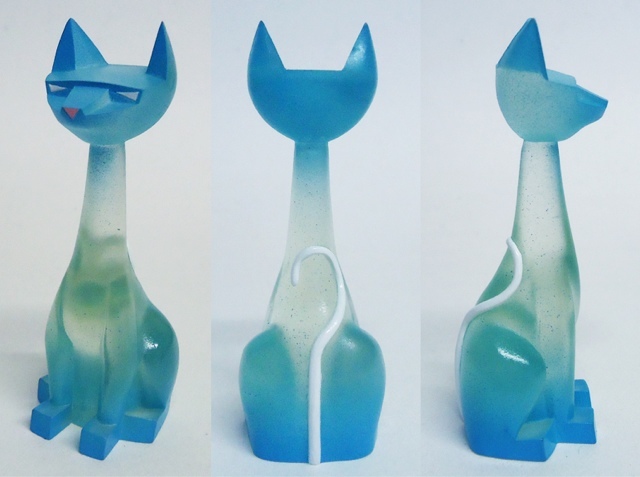 Wolf Voigt (creator of Solar Color Dust) has customized a bunch of his "Ice" OMFG Series 2 figures and they are available on eBay, right here. Aside from a couple with the holographic glitter (seen here on Cuddlehard), there are several with color-changing paintjobs, shown below. 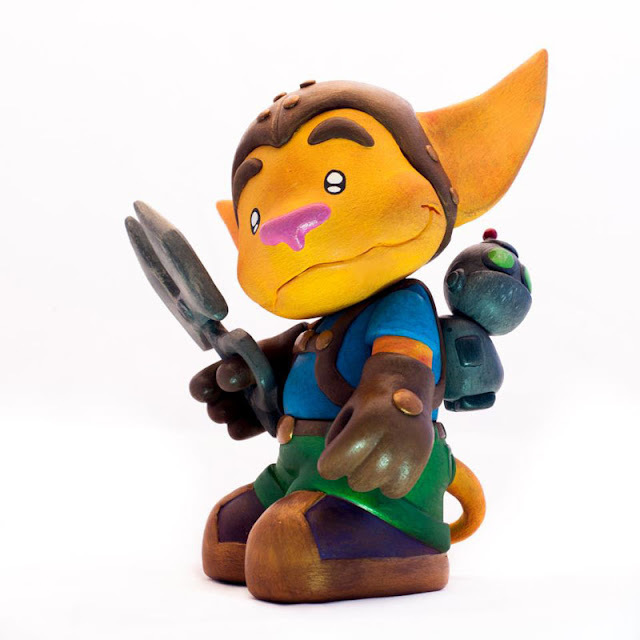 Wolf has long been known in the mini figure community for his technical wizardry when it comes to insane dyes and paints, and we are all glad to see him bringing his skills to OMFG. For a few weeks now, April Elliott (aka MaloApril) has been posting a few WIP pics of some recent customs she has been painting. 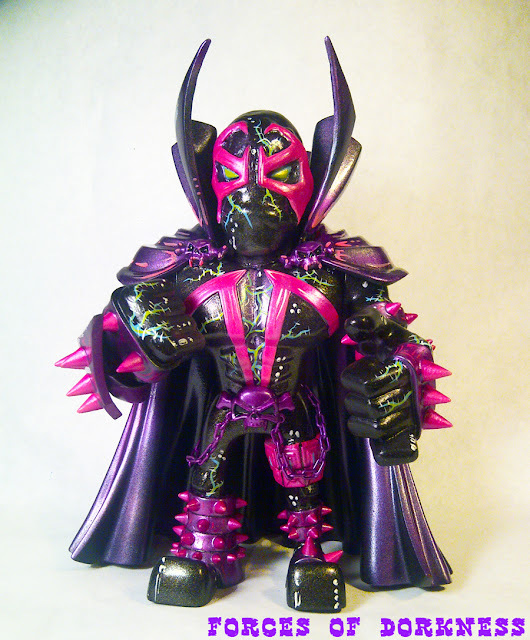 The original sculpting was done by JFury, while all of the painting and even a few accessories were completed by April. The colors are amazing on all of these customs. I especially love the dragon. The knight feature some awesome detail work, which includes painted chain mail, a shield and even a sword to complete the look. To see more pictures, head on over to April's Instagram. These are some very cool custom Dunnys! 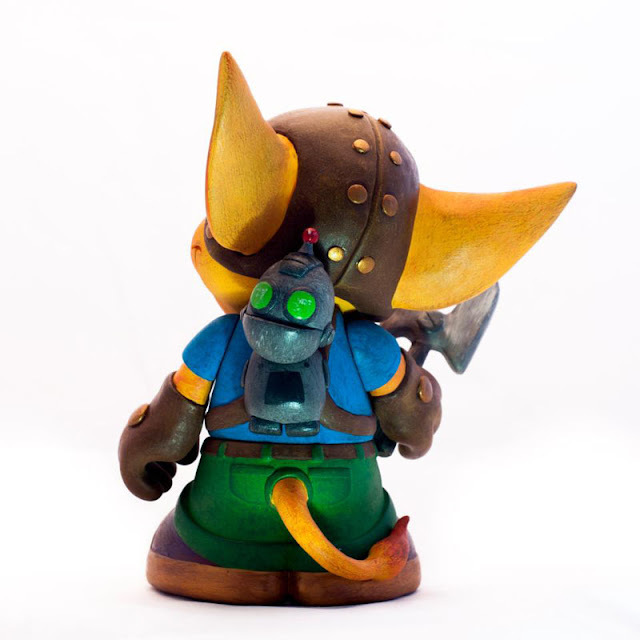 JFury is also painting up some dunnys that were sculpted by April. 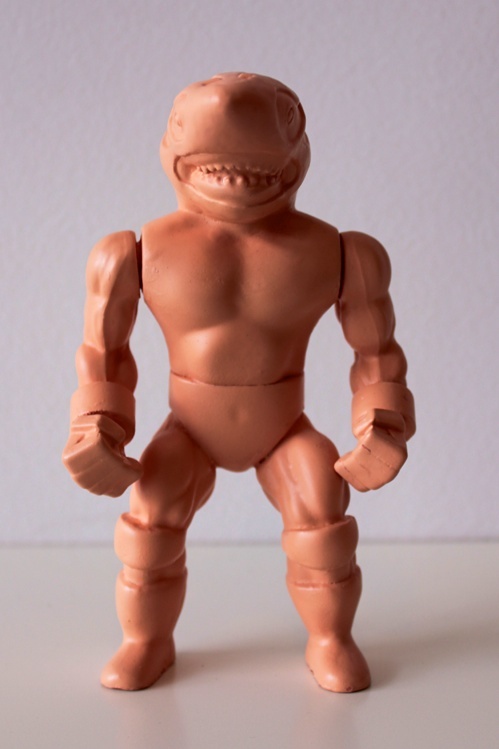 All of the customs are expected to be a part of Urban Vinyl Daily's sculpt and swap series. I don't have the official title of the series or even who else is involved, but based on a response I got via an instagram comment, the series is shooting for a Fat Tuesday drop. Just in time for some of us to spend some money before maybe giving up buying toys for 40 days. Rsin posted up this custom Yeti, which was commissioned by an avid collector. 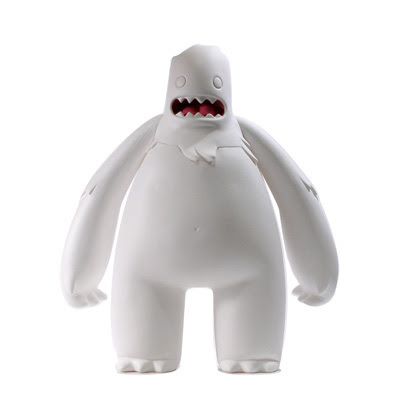 The custom is built off a lesser known figure, called Bill the Yeti, by David Lanham. 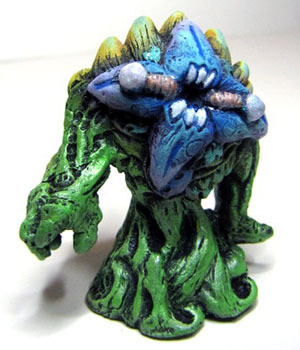 Based on the original figure, it seems that Rsin added some sculpting to give it more of an Rsin Art look, as well as painted it up with some great colors. I like the color palette of this figure. It's a bit different from Rsin's regular orange and black palette. Another great custom for Rsin to start off the new year with. If you have an idea of a custom or just want Rsin to make something for you, make sure to hit him up and get your name added to what I imagine is a growing long list of commissions. We are now offering up 300x125 and 300x300 banner ads for $15 and $25 per month, respective. We are using Passionfruit Ads to set up and run the advertising on this blog. Any ad purchased via Passionfruit will be displayed at the TOP of the side columns and will be viewed at least 1,000 times per day by our readers. Banner advertisers can pay monthly or yearly via Paypal. Money collected from these ads will go to our team of writers. These are dropping on Thursday, January 17 at 9pm Eastern U.S. time. They are limited to 160 pieces and come bagged with a header card that he designed for this drop. 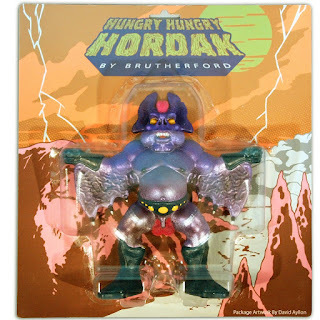 Each figure is $5 usd with a maximum of 3 per person/ household. Artmymind just posted up a recently finished commissioned set called "Tetsunoken Squad". 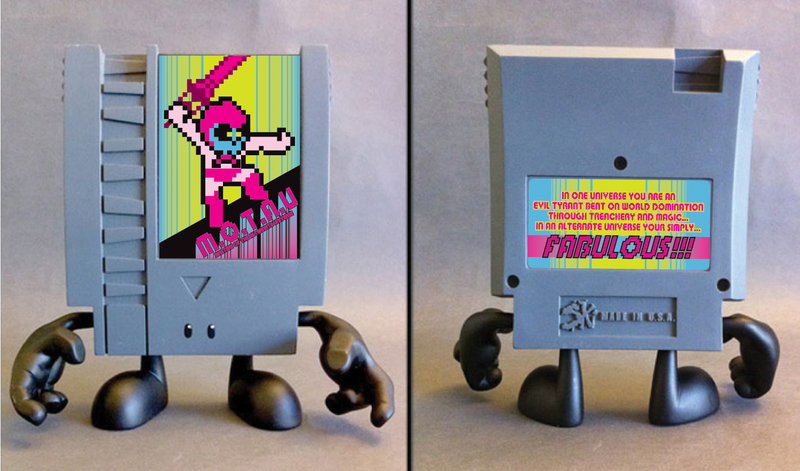 In the middle of moving and creating awesome show pieces, Artmymind found time to create this awesome set of customs. 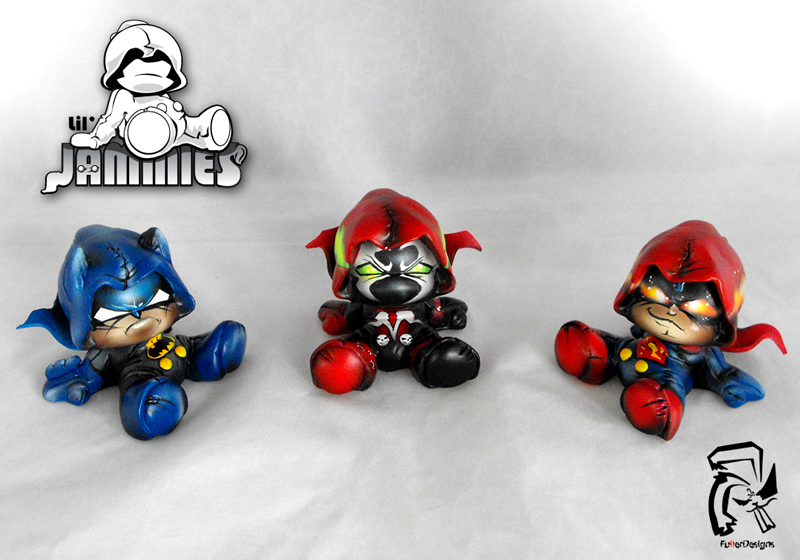 This amazing set includes a custom 3" Dunny and 7" Munny. I really like the sculpted pieces on both figures, as well as how the hoses and metallic looking armor gives both figures a nice cyborg feeling. The details and finish on both pieces are clean, as always is the case with Artmymind pieces. This set is going to make one patient private collector very happy. 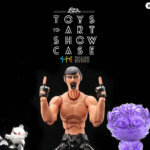 If you want to see more pictures of these amazing figures, head on over to Artmymind's Facebook page and give it a like. 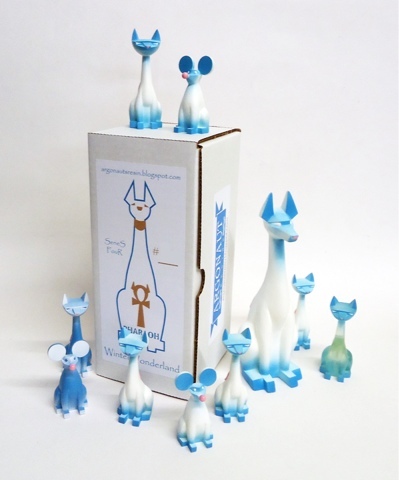 Dutch artist and Flawtoys proprietor, Sander Dinkgreve, is dropping his War Custom series over at Flawtoys eStore. 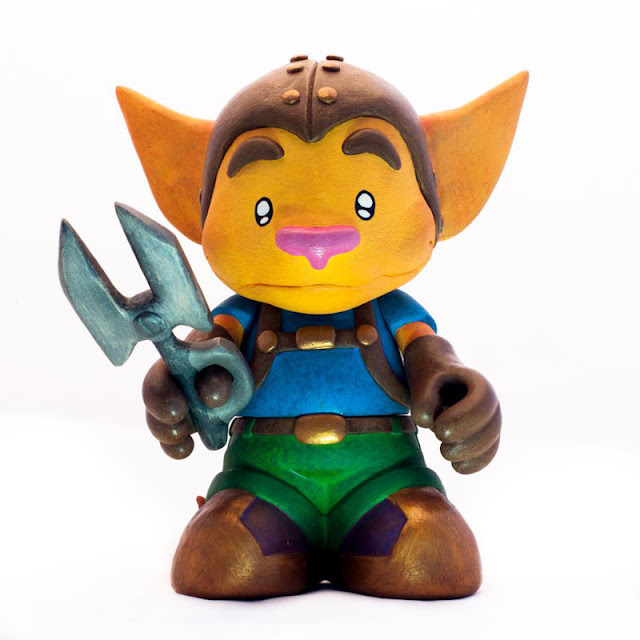 This custom series is composed of 6 different customs across varying platforms; 7" Munny, 4" Munny, 4" Zukie, 4" Teddy Troop, 3" Dunny and 2.5" Labbit joined by 2 accompanying paintings on canvas. "The War customs are creatures born into a hostile environment. The creatures all teamed up to form a respective clan. They have wooden mask and patches to prevent themselves from getting killed or hurt." - Sander D.
Each custom is hand sculpted and painted. Each piece features a unique combination of roughly textured, weathered, organic-looking masks and sharp, clean, seamless paint application. 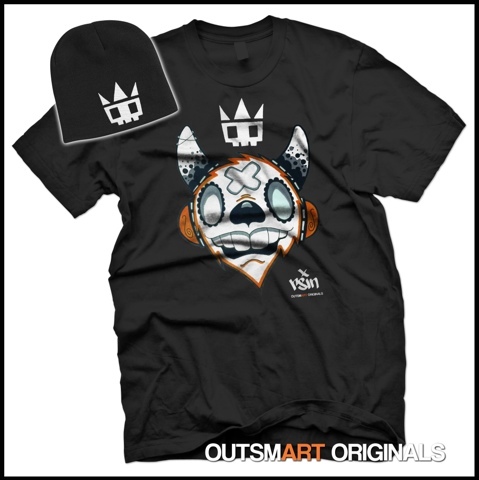 outsmART originals proudly announces the next incredibly designed t-shirt in their 2013 lineup: THE CROWN by RSIN! We are also introducing a brand new item to our collection, an 8” knit beanie featuring an embroidered RSIN crown crest! 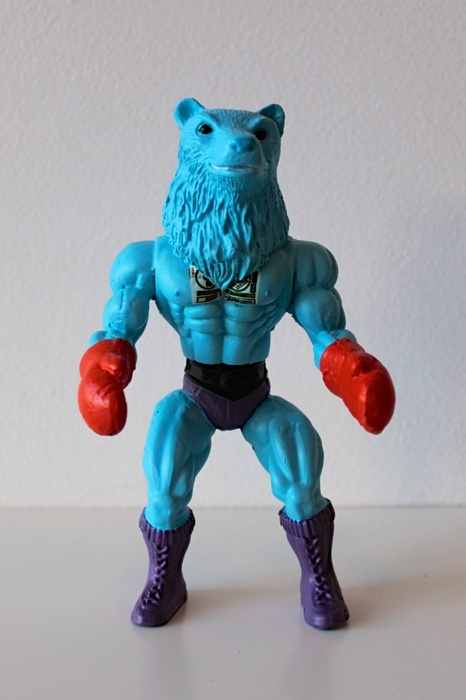 As an additional super bonus, RSIN has agreed to create an original custom 4” Dunny that will be given to one lucky customer! All you have to do is purchase one of these new items and you will be automatically entered into the drawing for the custom. It’s good to be king! Taken from the original NYCC 2012 edition tee, this latest incarnation will be screen-printed on a black ULTRA COTTON t-shirt for that classic and comfortable fit (remaining ultra soft without being clingy) available for men and women. The shirt will retail for only $20.00. The Beanie, featuring an embroidered CROWN logo by RSIN, is a one-size-fits-all 8″ knit style cap for $15.00 each. To make this an extra special deal – you can purchase both items for just $30.00 – that’s a $5.00 savings! Both items are guaranteed to ship by February 8th. 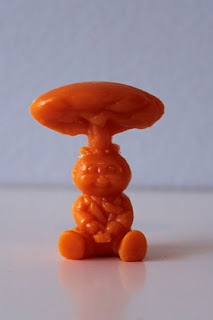 Remember, every item purchased will count as an individual entry for your chance to win an original 4” Dunny by one of the hottest designer toy artists in the realm. The more you buy, the better your chances – reserve yours today and wear the Crown proudly. Sisters of death "MIQUITL" & "XOCHTL"